WHAT IS YOGA FOR HEALTHY LOWER BACKS? “Yoga teaches us to cure what need not be endured and endure what cannot be cured.” BKS Iyengar. is a common problem, affecting 80% of us at some point in our lives and can be debilitating, impacting on quality of life and ability to work. Mind-body group exercise, such as Yoga for Healthy Lower Backs is recommended by the health regulator, NICE as a first step towards managing low back pain. It is a specialist programme that gently and progressively aims to help people get back to being more active again. The course teaches life-long skills to improve health. It was developed and tested in a large research study, run by the Universtiy of York (Department for Health Sciences) and funded by Arthritis Research UK. The positive results showing it to be safe and effective were published in the Annals of Internal Medicine in November 2011. A cost evaluation in the journal Spine in 2012 showed it to be cost effective for the NHS, society and the workplace. 12 weekly clases comprising easy foundational yoga poses to build strength and flexibility, providing long term benefits. Poses target back comfort, good posture and re-alignment of the body. Guidance, homework plans and information so that you can practice on your own in between classes. A relaxation CD and Yoga for Healthy Lower Backs book. Students learn how to bring postural improvements, mental focus and relaxation techniques into their daily lives. 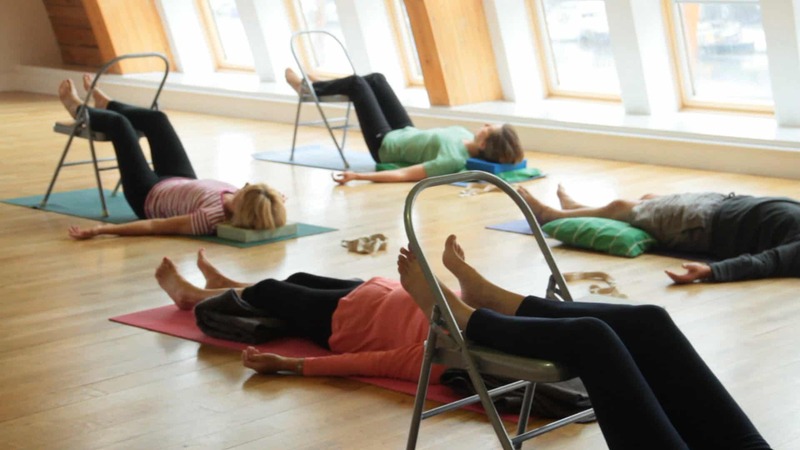 Taught to small groups (average class size 4-8 people) by experienced, senior yoga teacher. At the end of the course students are encouraged to continue practising on their own, or to join a suitable yoga class. “Yoga has a track record of improving chronic pain in multiple conditions. Uniquely this long term self-management course is the essence of prevention. It offers a toolkit of simple lifelong techniques to improve and maintain holistic health and well-being.” Alison Trewhela, Principal Tutor and Director, YHLB Institute. “It doesn’t just focus on the back, but the whole body and mind. I feel it is benefitting my whole body. It starts very gently – you’re not made to feel inadequate or unfit. Wish I’d found this years ago.